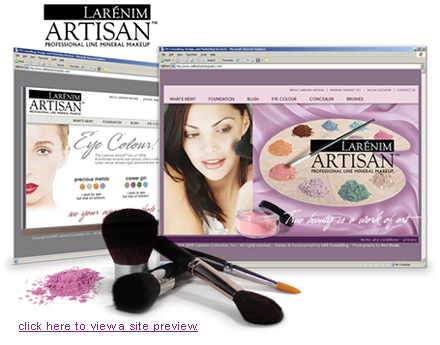 The founders of the original Larenim Mineral Makeup wanted to create a new, more upscale line to be carried in spas, salons, and fine department stores. So they needed a new name, a new image, and an entirely new marketing campaign. We created the Larenim Artisan line, borrowing from the allure of finely crafted works. This new opulent line needed its own identity and a softer, more rich appearance. And it needed the collateral to go with it to aid brokers in placing the Artisan line in the right venues. For the website design, soft colors and deep neutrals adorn the pages, so as not to conflict or compete with the rich colors of the makeup itself. The theme of the classic painters' palette was chosen as its signature look, further underscoring the product name and identity. As with the original Larenim site, photography had to be cutting-edge, sharp and clear, and needed to convey an appealing message. 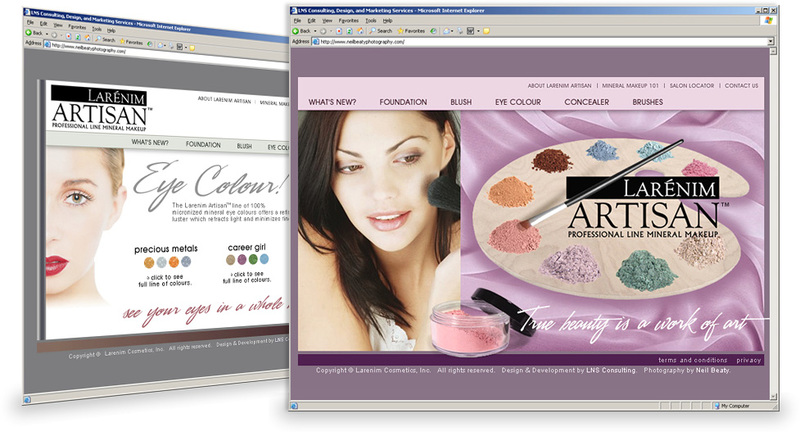 Main page photos of models were accented by jars of makeup, brushes, and spills. This site is currently in development.